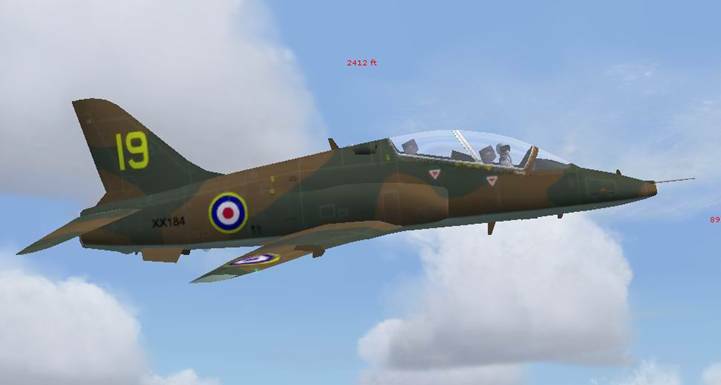 This Freeware AI package for Microsoft Flight Simulator 2004 (FS9) contains everything needed to add a special AI Hawk aircraft of the Royal Air Force to your virtual skies. The Hawk has been in service with the Royal Air Force since 1976 and is most famous for being the aircraft that is used by the RAF Aerobatic Team, The Red Arrows. 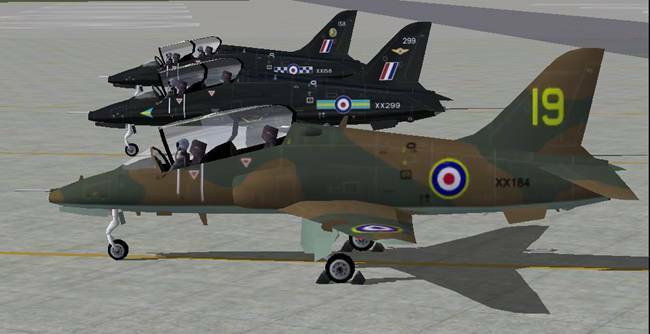 The Hawk is widely regarded as being the best Jet training aircraft that has ever existed. Make sure if you don’t have it already, to download Part 1 of this package, “Valley Hawks” featuring the Hawks of No. 4 Flying Training School, No’s 19 and 208 (Reserve) Squadrons based at RAF Valley, Anglesey, Wales, UK. And keep your eyes peeled for more packages from MAIW which cover the various export variants of the BAe Hawk in use by Air Forces around the world, and a full AI display by the famous Red Arrows. And also Part 2 which brings you Hawks from No.100 Squadron Royal Air Force based at RAF Leeming, the Fleet Requirements Air Direction Unit at RNAS Culdrose, the Naval Flying Standards Flight at RNAS Yeovilton, and Empire Test Pilots School, RAF Centre for Aviation Medicine and Qinetiq at BAe Boscombe Down. To learn more about MAIW or to become a contributor, visit our website at http://www.militaryaiworks.com. NOTE: Failure to remove these duplicate files may result in problems with AI aircraft parking and operation. It is recommended you move these to a temporary folder instead of deleting them; however, you should not need them again as the AFCADs included in this package are thoroughly researched and highly detailed. If you are using add-on scenery for one of the above airfields, it is recommended you do NOT remove the AFCAD for the add-on scenery, but instead remove the MAIW AFCAD file (e.g. MAIW_AF2_EGOV_DEFAULT_GL.bgl) after installation. Fix action: Install the EditVoicepack software. The callsigns used in this package are actual callsigns used by this unit in WW2, based on information obtained in manuals and on internet.